Before you opt to retain a criminal defense attorney, you must first determine if this is the right type of attorney for your needs. You should hire a criminal defense attorney if you have been charged with a crime or are being investigated by police. There are many reasons that you should hire a criminal defense attorney. Here is a list of the things that they can do to help you. 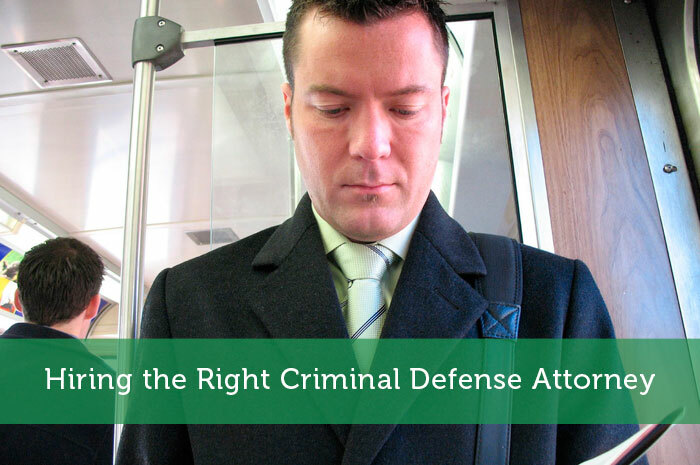 It can be frustrating to find the right criminal defense attorney. Try to look for someone who has years of experience in the field of criminal defense. These professionals can best guide you in the direction that will have the most positive outcome on your situation. It is also important that you choose someone who has experience in the type of crime that you have committed. Criminal defense attorneys can specialize in many areas. Understanding their specialization can really help you make the right choice. For example, you should choose someone who specializes in federal law if you are being charged with a federal crime. When you are charged with a crime and have limited finances, there is a good chance that you will be eligible to have a public defender assigned to your case. This might not be the right choice for you. Generally speaking, private defense counsels can do more for their clients than a public defender who is in the same courtroom daily. The court and prosecutors cannot do anything special or out of the ordinary, for the public defender clients because they would have to do the same thing for all the public defender clients! There is a disbelief that all public defenders are incompetent compared to private defense attorneys. While this is the case sometimes, it is not always the case. However, private criminal defense lawyers do have more time to devote to your case and to you, which is the big advantage that can really make a difference in the ultimate outcome of your case. In order to receive the right information from a criminal defense lawyer, you have to know the right questions to ask. These include inquiries that will help you to identify if he/ she have the experience working on your type of case, if they have handled jury trials in the past, are they familiar with the people who work at the courthouse where your case will be heard, and information about their payment policies. If you are already in jail, finding a lawyer might be more difficult. There are three main ways that you can get assistance in finding the right person to represent you. Ask your friends or family to help you find someone that is specialized in the area that you need. Once your family finds a potential attorney, arrange to call the lawyer collect. Being able to speak with your attorney by phone is crucial. Lastly, have your family talk to a bail bondsman. A bondsman should have lawyers that they work with on a regular basis. Finding the right criminal defense attorney to fight for your rights is critical if you have been accused of a crime or crimes. This information can help you retain the one that you can trust. It’s important to work with a criminal defense attorney who can establish a balance of power in the court room. Like you said, it’s really important to pick an attorney that specializes in your needs. You would not want to pick a divorce attorney when you have a criminal defense case. I would want to talk any potential lawyer I’m hiring before the situation and make sure they have experience in what I’m dealing with. Thanks for the awesome tips and info! I didn’t know that a criminal defense lawyer could help you find a bail bondsmen. Do law firms usually have a bondsmen they suggest working with? I appreciate ll the tips you have on finding the right attorney. Hopefully I wont need one, but if I do I’mm make sure to remember all this. Thanks! Your suggestion to have family contact a bondsman was really smart. Like you mentioned, they should have a lawyer they usually work with so that makes the process easier. It may also be a good idea to gather as much information as possible about the bail process to help it go smoother. Getting the right lawyer can make all the difference in your case. I assume that people get lawyers because they are not confident in defending themselves. I did not know that private criminal defense lawyers have a lot more time to devote to a case than a public defender. My brother will need to hire a criminal defense attorney soon and I have been doing research to find the best one for him. I didn’t realize that criminal defense attorneys could specialize in a specific area. I will have to look up one that will help my brother in his specific case. It makes sense that you might want to hire a good criminal defense attorney if you are accused of something. They can do a lot for you! Not only can they ensure that you handle the paperwork correctly, but they will also ensure that you get through court untouched! My brother is currently dealing with a drug offense case. We want to make sure we can help him find the best criminal defense attorney to help him. I agree with you that it’s important to ask the right questions to make sure the lawyer has experience with similar cases to yours. Thanks for sharing! Referrals would be a great way to find a lawyer to represent you. Speaking with their past clients would give you an idea of how they work. My cousin has said that it is worthwhile to find someone with excellent communication skills in order to get your questions answered in a prompt manner. I really like how you talked about trying to find someone who has years of experience in the area that you need help with, and for us right now, that would be a great DUI attorney. My brother recently was stopped for a DUI, and I think that having the help of an attorney could be really helpful for his case. I’m going to have to see if I can find a very experienced DUI attorney that can help him when he has to go to court. Thanks for the suggestion! This is some great information, and I appreciate your suggestion to find a criminal defense attorney that has a lot of experience in that area. I just got a DUI, and I want to make sure that I’m making the best of this situation, so I want to hire an attorney to help me with my case. Maybe it would be a good idea to hire someone who has a lot of experience specific to this area of law so I know they really know what they’re doing. I like that you provided some tips for hiring the right criminal defense attorney such as asking for referrals. Your friends and family may be able to recommend someone whom they have worked with previously. Also, you may want to check for reviews and testimonials from past clients. This should give you an idea if the attorney is indeed reputable. If I were to hire a defense attorney for a traffic violation I committed, I would make sure to keep this in mind. Thanks. It’s great that you’ve mentioned that a criminal defense lawyer has more time to devote to their client and their case, which is the big advantage that can really make a difference in the ultimate outcome of their case. One of my friends was issued a subpoena to attend an arraignment for a case in which he is the defendant. Knowing the advantage of getting a criminal defense attorney, I’ll mention to him that he should do what he can to find one so that he will have a good chance of winning that case because the lawyer has enough time to work on it.